Description: From book jacket: He was a nameless orphan marked for death for an unknown crime. Discovering his name only intensified the mystery. Then he met Bear, who helped Crispin learn the secret of his full identity. In Bear, Crispin found a new father and a new world, and the two set off to live as free men. But they don’t get far as the past catches up to them. Review: This is a nice follow-up to the first book, but it is a bit darker. It takes up exactly where the first book left off, which is nice, and the adventure continues. Crispin and Bear still live in bleak and depressing conditions, and encounter some who are even worse off than they are. They do discover kindness where it is least expected only to then face horror. I was anxious to read this second book in the series, but was a bit disappointed with the pure sadness of it. Positive: Crispin and Bear do find kindness and their love as father/son is further cemented with more love added in. 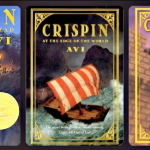 Crispin is able to discover that the world is bigger than he ever imagined. Spiritual Elements: The book is heavily religious. Bear is constantly talking about and praying to saints. Being fiction, it is based on a number of historical facts which are listed in the back of the book and are interesting. It is there that it is explained that at the end of the fourteenth century, when this account takes place, that Christianity is the established religion, but all kinds of pagan beliefs and practices continued and take place in this book. Violence: The plot revolves around adventure, and there certainly seems to be more violence in this book, I think. There is an arrow wound, a birth gone bad, and a character violently murdered, and that is not even the end of the violence in this book. Other: While the adventuresome spirit of the book can be fun, it is still a darker book and not for the faint of heart or depressed.